Egyptian President urges Palestinian Arabs to be ready to co-exist with each other and with Israelis in safety and security. Egyptian President Abdel Fattah Al-Sisi on Tuesday urged Palestinian Arabs to overcome their differences and be ready to co-exist with each other and with Israelis in safety and security. "I tell the Palestinian people it's extremely important ... to overcome the differences and not to lose opportunities and to be ready to accept co-existence with the other, with Israelis in safety and security," Sisi said in a speech before the UN General Assembly, as quoted by Reuters. Addressing Israelis, the Egyptian President said, "We have an excellent experience in Egypt in peace with you for longer than 40 years." 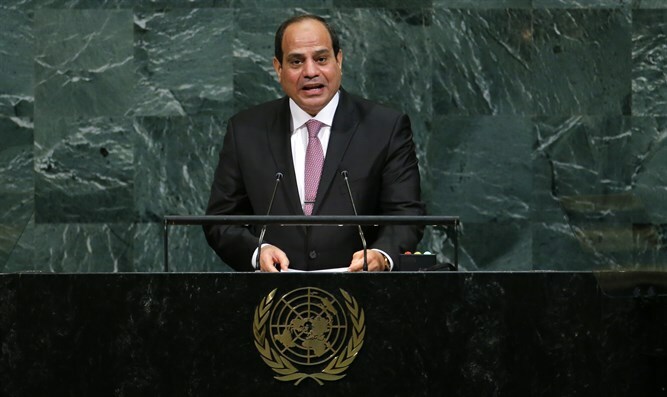 "We can repeat this experience and this excellent step once again - the peace and security of the Israeli citizens together with the peace and security of the Palestinian citizens," Sisi told the 193-member General Assembly to a round of applause. The Egyptian President’s speech came hours after he met with Prime Minister Binyamin Netanyahu, marking the first time the two have held public talks. They twice met for closed-door talks in 2016. The 90-minute meeting at the Palace Hotel in New York City covered regional issues including instability in Gaza and efforts by the Trump administration to reboot talks between Israel and the Palestinian Authority. Israel and Egypt signed a peace treaty in 1979, with Egypt becoming the first Arab country to sign a treaty with Israel. Sisi’s comments also follow an announcement by Hamas this week that it was willing to hold talks with Fatah, which is headed by Palestinian Authority (PA) chairman Mahmoud Abbas, as well as to dismantle the Gaza administrative committee, which served as a local independent governing authority. Abbas’s spokesman welcomed Hamas's decision to restart reconciliation efforts earlier this week, calling it "a step in the right direction" and a "genuine historic opportunity" to end the rift between the sides. On Monday, Abbas and Hamas leader Ismail Haniyeh spoke for the first time in nearly a year.